What’s open for Thanksgiving dinner in Door County? That’s a question I see posted a lot in the Door County Vacationers group. Thanksgiving is a time to show thanks and share our gratefulness with others. That first Thanksgiving the Pilgrims celebrated in America with the Indians lasted for three days. Well, I’m not sure I want to celebrate for three days, but that one day is glorious. Cooking at home can be fun...but isn't for everyone! How about breakfast on Thanksgiving Day? Cooking at home can be fun…but isn’t for everyone! Cooking Thanksgiving dinner at home can be lots of fun, having everyone gathered around the dining room table is something I am always thankful for, but the cook & clean up isn’t for everyone, so you might be one of those who ask, “What’s open for Thanksgiving in Door County?”. 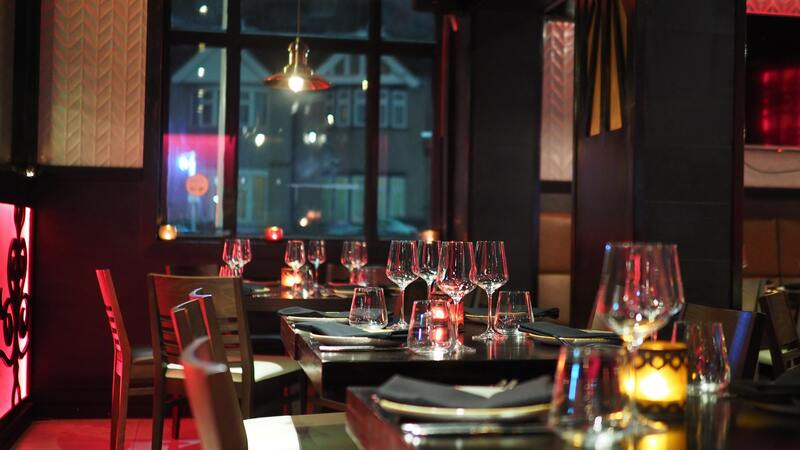 There are some really nice places to enjoy Thanksgiving breakfast, lunch or dinner. Since the places open are limited they start to fill up quickly. I suggest you make your reservations, especially for dinner, in the next day or two. Maybe you would like to pick up your meal, have it delivered, or just grab some desserts, I’ll give you some information on those options too. Buffet 11:00 a.m. -5:00 p.m. Located on the Lake Michigan shore in Baileys Harbor. Enjoy a fantastic meal and watch the every-changing Lake Michigan waters. The Carrington (also known as the Landmark Restaurant) has a relaxed and inviting atmosphere with a fantastic view of the harbor. The meticulously detailed log structure offers a cozy atmosphere and the kids will spot the carvings of bears, eagles, buffalo, and fish throughout the Den. A classic Door County supper club all dressed up to welcome you on Thanksgiving. 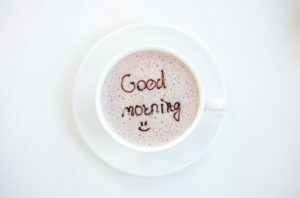 Plus, and early dining option for those early risers! 11:00 a.m. – 5:00 a.m.
A Door County Magazine “Best of” winner. Need we say more? 11:00 am – 7:00 p.m. The feel of an elegant old English supper club with the finest in dining. A plus–they have a Green Bay location and will serve plated dinners at that location. Yes, there are a few places where you can pick up dinner to serve at your table. I’ve tried each and find them to be really good! 5:00 a.m. to 10:00 a.m. 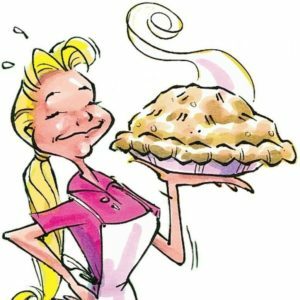 They are open Saturday & Sunday in the winter–so if you want a pie for Thanksgiving you’ll have to get there the Sunday before. But, you have second chance, Bargain Monday–open Monday until they run out of pies. If you don’t get there before Thanksgiving, hit them the Saturday after the feast!! Another excellent bake shop where you’ll need to get there the Sunday before. And, if you don’t catch them on Black Friday morning! Breads & pastries & pies…oh my! And you can catch them open every day until Thanksgiving. You might think you want something more than a plain market pie for your Thanksgiving dessert…the bakery here is really good and they’re open every day! Don’t want to spend the day alone? Want to meet some new people? Then one of the Thanksgiving community meals might suit you. Thanksgiving day is a day for family and friends, and for deer hunters. 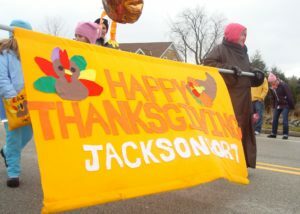 I would be remiss though to not mention the Jacksonport Thanksgiving Day Parade. It may not be impressive as the Macy’s parade with its large balloons, but it is always for a good cause. The parade marches four blocks, turns around, and doubles back so everyone gets a second look! The parade organizers are the Sturgeon Council from Sevastopol High School and the DECA from Gibraltar High School, and their mission and the mission of the parade for the last 22 years has been neighbors helping neighbors—to raise funds to help families in need. The parade includes reindeer kids, the joint high school band, color guard horses, goats, super hero, and you just never know what the entries will be year to year. If you want to enter, just be at the Jacksonport fire station by about 9:45 on Thanksgiving Day. There is a $100 prize for the best parade entry. The student groups have collected an amazing array of prizes for the raffle, winning tickets to be drawn at Island Fever after the parade. Along the parade route there will be an opportunity to donate for this year’s recipient and to help purchase gifts for families in need this holiday season. Paula Symons has been the elementary secretary at Sevastopol School for the past 19 years—everyone knows and loves her. She might sometimes be known as Pioneer Paula! 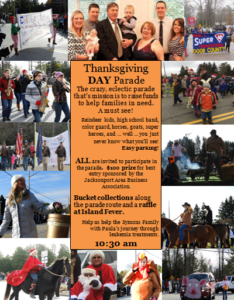 Purchase a raffle ticket or catch the donation bucket along the parade route and help Paula and the Symons Family with Paula’s journey through Leukemia treatments and a stem cell transplant. The student groups also use some funds to purchase Christmas gifts for area families in need. Warm wishes for a Thanksgiving celebration that is filled with everything that brings you happiness. See you in Jacksonport! !